Cleaning your tile floors can be a hassle and back breaking. Regular mopping is good but eventually it will need a professional tile and grout cleaning to get all that embedded soil. While ceramic tile is non-porous your grout lines are not. 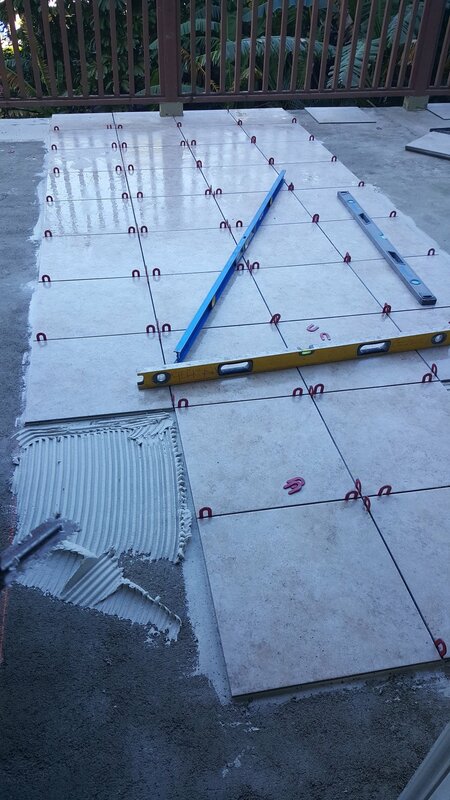 We clean each and every grout lines to remove ground in dirt and soil to rejuvenate and refresh your tile and grout. We also clean and polish natural stones, decks, driveways and repairs or remodeling of your old kitchen and bath tiles. Call us for a free estimate today! Ceramic tile is the most durable type of tile and requires very little maintenance. Depending on it's surface texture it can trap dirt and grime and look dirty like the photo above. We offer complete tile cleaning, repairs and even complete removal and installation. Natural stone requires a bit more attention especially if it is exposed to outside elements. We can customize a solution for all your natural stone needs from cleaning, polishing, sealant, repairs and even complete removal and installation. When it's time for new flooring, kitchen and bath remodeling you can be sure to count on us. It's a unique skill when it comes to tile setting and not everyone is good at it. Our installer are licensed and experience to get the job done right, no job is too small or too large.